3 dimensional (3D) machining sign, plastics, wood, molds, etc. Cabinet making Furniture, general woodworking manufacturing Store fixture, display manufacturing Sheet plastic fabrication Solid surface machining Non-ferrous metal machining (aluminum, brass, copper, zinc) Composite machining graphite, phenolic, Kevlar, etc. TO WATCH OUR MACHINES RUNNING PLEASE GO TO YOU TUBE and on the search bar write SIBE AUTOMATION. HIGH STRENGTH CUSTOM ENGINEERED ALUMINUM EXTRUSION DESIGNED TO ENSURE RIGIDITY. THIS IS A RUGGED, PRECISE MACHINE DESIGNED FOR PRODUCTION WORK IN AN INDUSTRIAL FACILITY. EASY TO OPERATE AND SERVICE WITH FULL CAD CAM CAPABILITIES. VISUAL MILL STD INSTALLED, ALL SOFTWARE WITH THEIR CORRESPONDING LICENCES. NEMA 34 , 800 oz/ inch. Z: NEMA 34 , 460 oz/inch HOLDING TORQUE. HIGH TORQUE AND HIGH PERFORMANCE INDUSTRIAL GRADE " SURE STEP" MICRO STEPPING DRIVERS HIGH SPEED 3 AXIS MOTION CONTROLLER. ALL AXIS OF THIS GANTRY TYPE MACHINE ARE MOUNTED ON 1 LINEAR BEARINGS THAT RIDE ON HARDENED SHAFTS FOR MAXIMUM STIFFNESS. HANDHELD INTERFACE ALLOWS THE OPERATOR TO JOG THE MACHINE, SET FEED HOLD AND FEED RATE. FULL WORKING ENVELOPE IS 48" X 48", Z TRAVEL IS 10. FIMEC VARIABLE SPEED 3 HP SPINDLE MOTOR 0 TO 24000 RPM (speed adjustable on the fly). DRIVEN BY AN ATC VARIABLE FREQUENCY DRIVE (this is not an adapted hand router) OTHER SPINDLE SIZES AVAILABLE. WE INCLUDE THREE R200 PRECISION COLLETS, 1/4"-3/8"-1/2 , SET OF SPINDLE WRENCHES. OPERATES ON 220 VOLT, 20 AMPS, 3 PHASE OR SINGLE PHASE, OTHER VOLTAGES AVAILABLE. COMPUTER-SCREEN- WIRELESS KEYBOARD AND MOUSE-OPERATOR INTERFACE, DRIVERS, POWER SUPPLIES, HOME SWITCHES ALREADY MOUNTED, CABLED, TESTED. AS AN OPTION WE OFFER A VACUUM HOLD DOWN TABLE (REMOVABLE) POWERED BY A BECKER VACUUM PUMP WITH ACCUMULATING TANKS AND HIGH FLOW VACUUM VALVES. EACH ONE OF OUR ROUTERS COMES EQUIPPED WITH AN EXAIR TOOL COOLING NOZZLE. ON ALL OUR MACHINES WE PROVIDE 24/7 TECH SUPPORT IN ENGLISH ANDISH. WE WILL CRATE AND LOAD ONTO TRUCK. The item "SIBE AUTOMATION 3 AXIS CNC ROUTER 3D MILLING MACHINE 48 X 48 10Z PLUG & PLAY" is in sale since Monday, May 2, 2011. This item is in the category "Business & Industrial\CNC, Metalworking & Manufacturing\Woodworking Tools & Supplies\Equipment & Machinery\Routers". 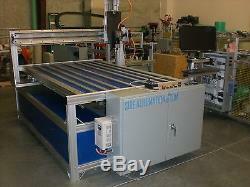 The seller is "sbautomation678" and is located in Ocala, Florida. This item can be shipped to United States.